Chris Brown has been ordered by LA judge to return to rehab for three months to deal with anger management issues. LA Superior Court Judge James Brandlin also said Chris Brown must do at least 24 hours of community service a week and be tested for drugs. Chris Brown, 24, agreed to the terms, which were suggested by probation officers overseeing his sentence for beating Rihanna in 2009. The singer left rehab earlier this month after throwing a rock through a window. After a joint counseling session with his mother on November 10, where she suggested he needed to remain in treatment, Chris Brown threw the stone through the window of her car. Chris Brown was kicked out of the rehab centre because he had signed a contract agreeing to refrain from violence while in treatment. He had gone to the facility voluntarily on October 29 having been arrested in Washington DC days earlier. A man accused Chris Brown of punching him after he tried to get in a photo with the singer. The event could still be considered a probation violation and result in further punishment for the singer. Chris Brown is due to appear in court in Washington DC on Monday. Judge James Brandlin ordered probation officers to get more information on the arrest in Washington for a hearing on December 16. He also said Chris Brown’s focus should be on his treatment and community service, where he will have to do tasks like litter picking or cleaning graffiti. In his probation report it says the singer has said he wants treatment for his anger management issues. Chris Brown said he was depressed after being ordered to re-do 1,000 hours of community service earlier this year after a hit-and-run incident. He has performed 20 hours so far, according to the report. An officer said Chris Brown wouldn’t complete his assignment if he was not required to perform at least 25 hours of work per week. Chris Brown appeared in court on Wednesday with his girlfriend Karrueche Tran and only spoke once to acknowledge he agreed to the terms given by the judge. His mother, who has been to many of her son’s court hearings, was not there. 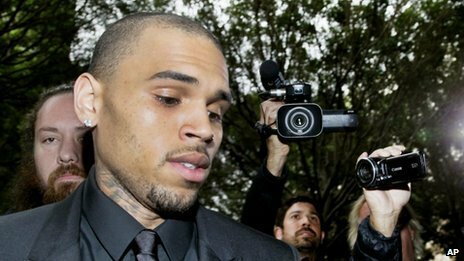 Chris Brown’s lawyer, Mark Geragos, said that the musician was also ordered to take any medications his doctor prescribed.